It isn’t that hard to find a healthy jam or jelly if you know what to look for. First, we need to talk about the difference between jam and jelly. Jelly is a clear fruit spread made with sweetened fruit juice and jam has both fruit juice and fruit pieces in the spread. The healthier choice will be jam because it has more fruit in it (and less sugar). Check out my article called What is the healthiest peanut butter? – you are going to need some P to go with the J. Also, if you like to experiment try my Strawberry Chia Refrigerator Jam – it has NO sugar added (but it does have some dates). I decided to take a look at my favorite jam that I buy without question. The "Bonne Maman" brand, made in France, reminds me of my 20's when I lived in Paris for 4 months. Without thinking, I pop this one in my cart because of a sentimental attachment (and I like the taste). BUT, is it healthy? Well, Bonne Maman, after spending a good 40 minutes in the jam aisle (worrying if security was going to interrupt me), I found Polaner All Fruit. The only thing I could find that differentiated jams from one another is the amount of sugar added to the fruit. What about the taste? The Polaner jam was less sweet, but it tasted great. I have made many PB&J's with this stuff and I haven't even noticed the lack of sugar. It is made with just concentrated fruit juice and fruit with pectin. It is my new cheaper and lower calorie "go to" jam. Do you have a favorite healthy jam? Good catch Snack Girl! If I wanted a PB&S (peanut butter and sugar) sandwich I'd make a fluffernutter! Less added sugar means you taste the fruit, not the sugar!! 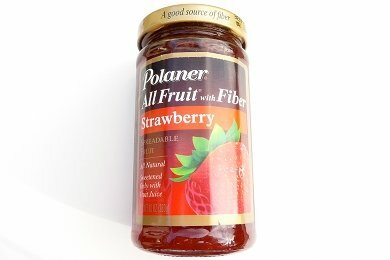 I love that Polaner All Fruit. Even though I don't eat a lot of jam, I spend a lot of time in the jam aisles reading labels! I am more of a PB&B girl myself. I love me some peanut butter and banana. But since I started limiting myself to 1 Tsp PB per serving, I can't even get the peanut butter to spread on a whole piece of bread! This is the first year I tried MAKING my own jam. Peaches were .33/lb and were delicious. I just learned that regular fruit preserves (in bottles) require more than twice as much sugar. We make tons of freezer jam which was so delicious without the tons of sugar or artificial sweetner. Try a high fiber english muffin (like Thomas' Better Start or something like that - 100 cal; 8g fiber; 1 WW point) and toast it - then you can get away with spreading a THIN coating of PB and sliced bananas...yummy! I've recently started to look at no-sugar jams. Hard to find one that isn't alternatively sweetened with splenda or something gross like that! Polaner is great. I like PB&H as in Peanut Butter and Honey....I have sugar free honey (found at Walmart) and I use the whole wheat sandwich thins from trader Joes! mmmmmmm mmmmmmmmmmm! I really like the taste of Smucker's seedless jam but it has HFC's. Need to wean myself off of it. So tired of HFC's lurking in every product. @susan: what oh what is sugar-free honey? Have you tried making freezer jam? I discovered this slice of heaven last year and made more this year! The full sugar version is AWESOME! The reduced sugar version is Very Good. Yes....sugar does make everything taste a little better. Anyway, the freezer jam only takes a short bit of time and is all homemade. My favorite breakfast is a piece of Ezekiel bread toast with almond butter and this very spread. Love that it has fiber! Now my kids say, "Can we have some of your mommy toast?" I love Crofter's Superfruit Spread - 30 cals, 7g sugar. Delicious. Good to know Polaner is a good jam. I'm more of a jelly person myself. I'm not overly fond of the chunks of fruit in my PB&J. I do like the Polaner when I'm making my truffles as it does have the fruit pieces in it. Trader Joe's makes a reduced-sugar jam that doesn't have any artificial sweetener, just less sugar. It's pretty delicious! I agree, we like Trader Joe's Reduced Sugar preserves. I have the raspberry in my frig right now and it has 8 g sugar and 35 calories in 1 Tbsp. But I will have to remember the Polaner All-Fruit when we can't get to TJ's. And I agree too, freezer jam is super easy. You can use less sugar with the right pectin. Still tastes great, even with leftover frozen Costco strawberries. And I agree with Kate, what the heck is sugar free honey...what's the point and how exactly is that made...that's just not right. Ingredients: Maltitol Syrup, Natural And Artificial Flavor, Acesulfame K, Malic Acid. ick! i think that's one of those sugar alcohols for sweetness, isn't it? Yeah, looks like it's just sugar alcohol, artificial sweetener and "flavor"
wouldn't you rather have *real* honey?